2017 is starting off well as 2 items were completed this week... both from Ottobre 05/2/016 issue.... and I am super pleased with both. 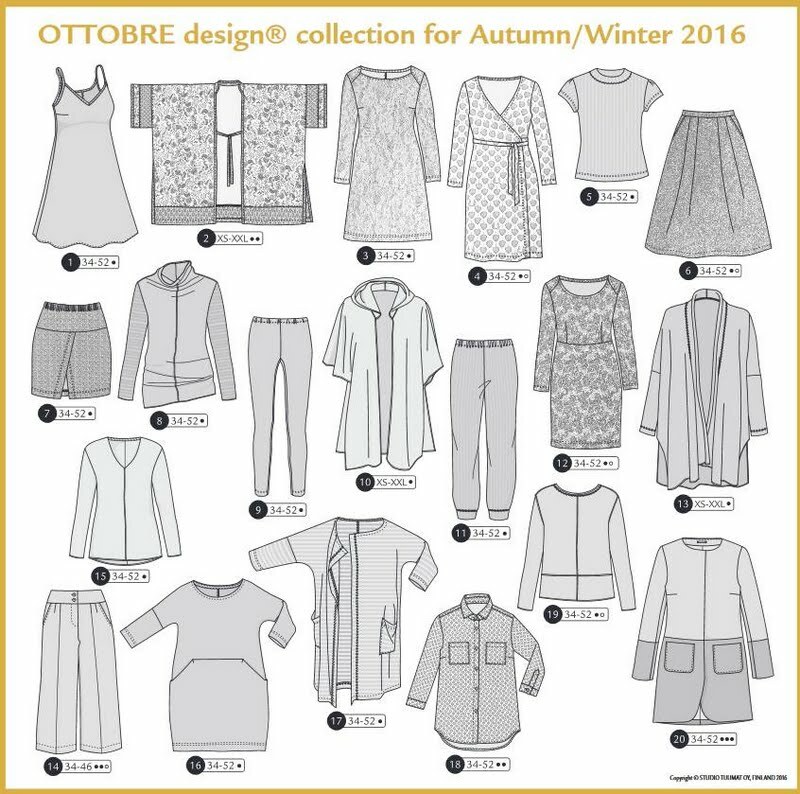 The Ottobre Design Woman magazines are published twice a year and can be purchased from her Etsy store or directly from her website. This particular issue is definitely my favorite as I've now made 4 items to-date with more planned. No. 15 Like a Warm Hug and no. 9 Classic Black Leggings were made in 2016. Today we'll be talking about no. 8 Drape Front Top and no. 7 miniskirt. No. 8 Drape Front Top is a cowl turtleneck with basically 2 pattern pieces as the #1 front piece is simply a modification of the back piece. So cool how that extra little bit at the top neck drapes and makes this lovely cowl. 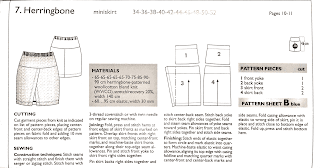 Center front, shoulder and center back seams are all serged rolled hem. Sleeves are inserted the flat method and sleeve hems and bottom hems are left raw. 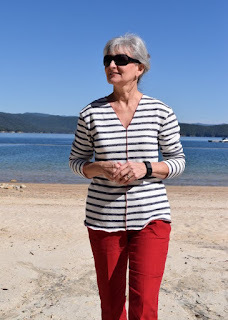 Super easy top to make and doesn't take much time at all. I made a size 38 with no modifications. Soft, drapey berry knit fabric purchased at Hobby Lobby. This top has already turned into a favorite. Pretty much everything was done on my serger. 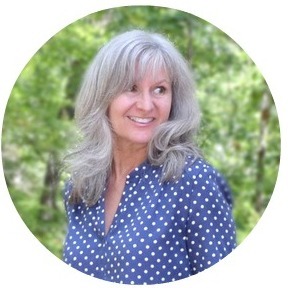 I've also worn this top with a collared jacket and the cowl sort of draped over the collar almost in a scarf-like way. .....because no. 8 Drape Front Top and no. 15 Like a Warm Hug top both use the exact same sleeve pattern. How cool is that! Two tops that couldn't be more different in design both using the same sleeve. No. 15 Like a Warm Hug was finished back in October 2016. 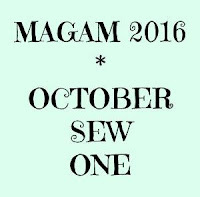 And if you might be interested in joining the Make a Garment a Month Challenger, Sarah Liz, our lovely administrator, will be happy to help you there. Okay, let's look at this oh-so-cute miniskirt. Though in my humble opinion, I'm thinking it's not quite so 'mini', so I may go back in a raise mine a bit. Anyway, no. 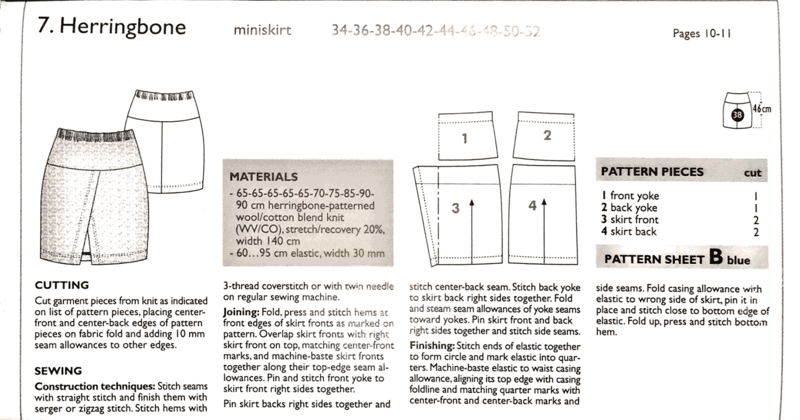 7 miniskirt pattern sheet from Ottobre 05/2016 shows a simple A-line elastic-waist skirt with front and back yokes. 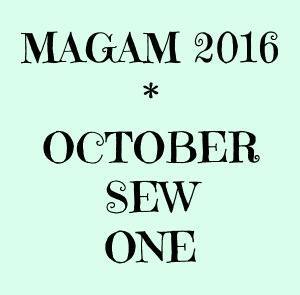 This does not use much yardage at all and am already planning another. It is also another quick make..... maybe an afternoon. Ottobre shows these 2 items together so that's what I wanted to do too. Super comfortable even over the black leggings. Took pains to match the fabric's pattern in the front and was successful, even though it photographs a little off here below. Twin-needled stitched the 1" hems with no channeling! About fell out of my chair with that one as that usually NEVER happens! 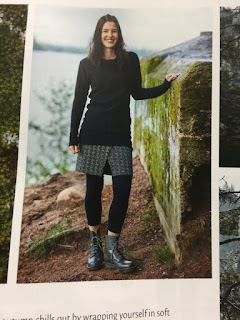 Part of my concern with this pattern was that the knit might hug my backside and look awkward. So, after tracing the size 38 and adding 3/8" recommended seam allowances..... I added another 1/4" to all the side seams. No problems in the rear. And yes, there is a center back seam there! Took a lot of pains to match my fabric's patterns at all the seams and succeeded well. Side seams too. And what you can't see is the most excellent bias-cut pattern matching on the back yoke! Kind of pleased with this even though no one but me will know. The front yoke was cut on the bias too. 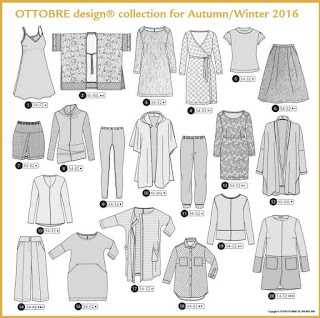 Thought it's be fun to show you Ottobre's photo (bottom left) of the exact same outfit I have on. Leggings, top and skirt. Am planning a black cardi to sort of pull mine together for those colder days. 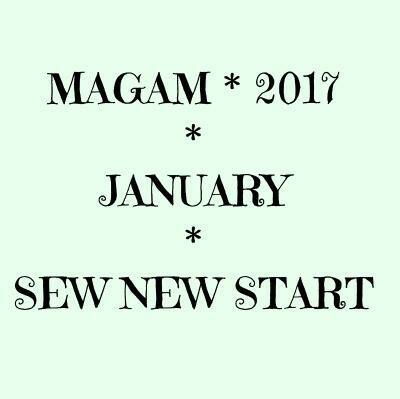 This also meets Make a Garment a Month January 2017 'Sew New Start' Challenge for me. And hard to believe that this time last week we were preparing for a terrible snow storm. We received 4 1/2" in my area and were home-bound for 2-3 days as temps lingered below freezing during the day and @12 degrees F at night. Today it's in the mid 70s. It is hot as these photos were taken. I am NOT complaining!!! Very cute outfit, Lisa. 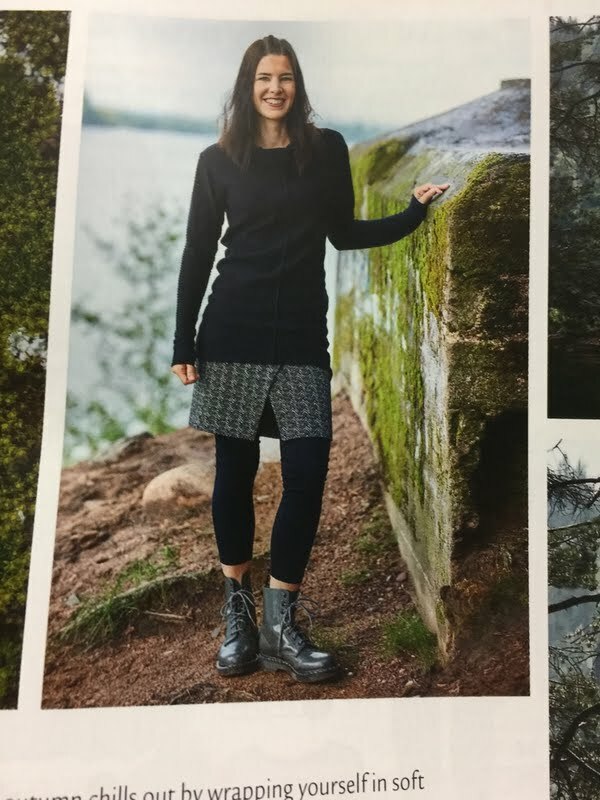 How would that skirt be if you didn't wear leggings? Would it be too revealing? 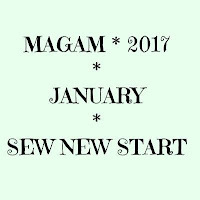 I'm working on my January MAGAM but as it is a lined jacket - and my first one - I'm not too hopeful it will be finished by the end of the month. I do declare, you could be a model in a magazine! Lovely outfit, both items are really cute.. (I wish they sold Ottobre here). I was just wondering ..How does the skirt behave when you sit down? Would it show too much if worn without leggings as a summer skirt? I just adore the top with the lovely neck - and of course the previous version. The skirt is lovely, but like everyone else, I wonder if it would gape too much (especially sitting) to be worn without leggings. Although of course, it is nice to layer over leggings- adds the modesty factor when needed. 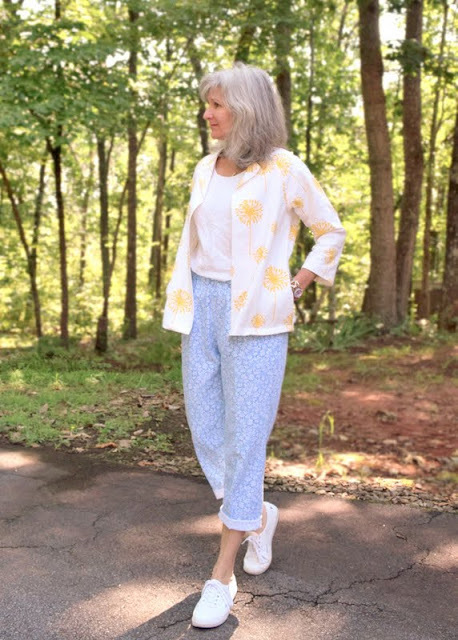 This magazine really does it for you :) your new outfit looks great and I'm impressed with your pattern matching skills! Looks perfect! Beautiful outfit! And very practical too! You can wear this outfit for many different occasions depending on how you accessorize it. The colours really suit your complexion.